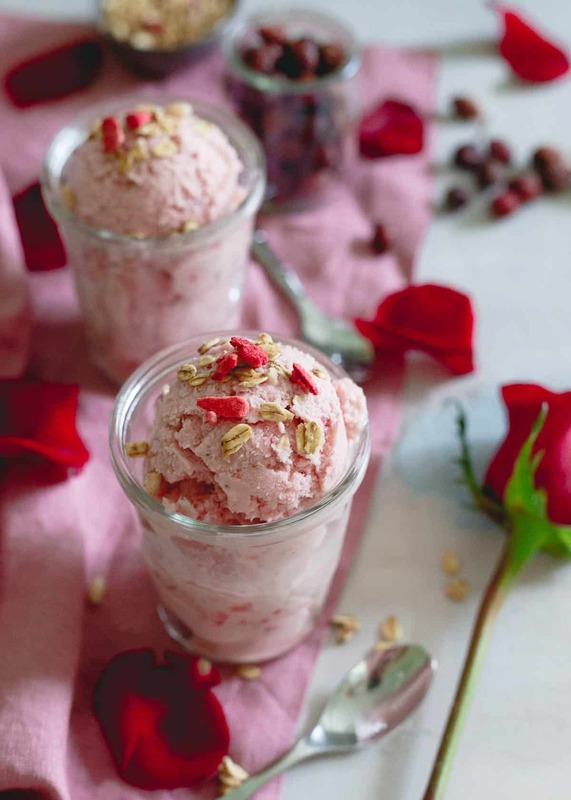 This rose hip ice cream is made with half milk, half Greek yogurt for the perfect balance of creaminess and tang. It’s filled with strawberries, granola and infused with a subtle rose hip flavor making it a great spring dessert. If you ever find yourself in Cabo San Lucas, promise me you’ll go to this restaurant called Flora Farms. This past trip was my third time there and the place somehow seems to get more magical with each visit. 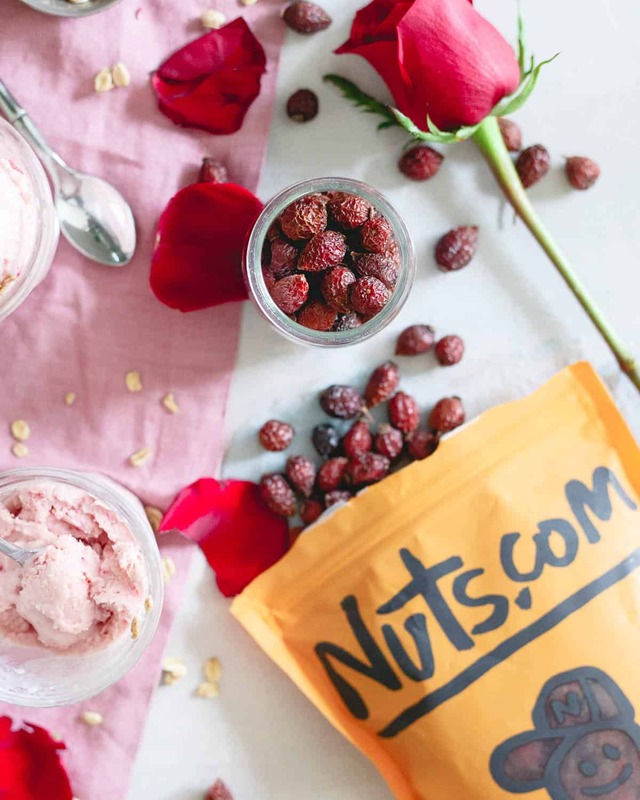 *This post for strawberry granola rose hip ice cream is sponsored by Nuts.com, a 2017 partner of Running to the Kitchen using their fun new dried rose hips! All content and opinions are my own. Imagine a rustic farm to table compound with huge gardens, bungalows, farm dogs wandering around, boutique shops filled with local artisan products, live music and tiny little ice cream cart right outside the hostess station. Not to mention a menu that will make you wish your stomach was bottomless and you could try every single on it. All of this set up in the hills of San Jose del Cabo, in Baja Mexico. If I had the chance to live there tomorrow and abandon everything about my current life, I’d do it without second thought. This past visit was the first time I decided to get ice cream from that cute cart. With flavors like lemongrass lavender, strawberry basil, carrot mint, roasted fennel and white chocolate pumpkin seed it was too hard to resist. I got the last waffle cone of the night (with a scoop each of the lavender lemon and strawberry basil) 3 minutes before the cart closed. Eating that ice cream as we drove down the dirt road mountain through herds of cows on the side of the road (literally) was one of my best memories of the trip. The chalk board of unique flavors in front of that ice cream cart is what inspired this rose hip ice cream creation. I’ll be working with Nuts.com this year showcasing some of their newer, more unique products and when I saw rose hips on the list, I immediately knew I wanted to do something with them. 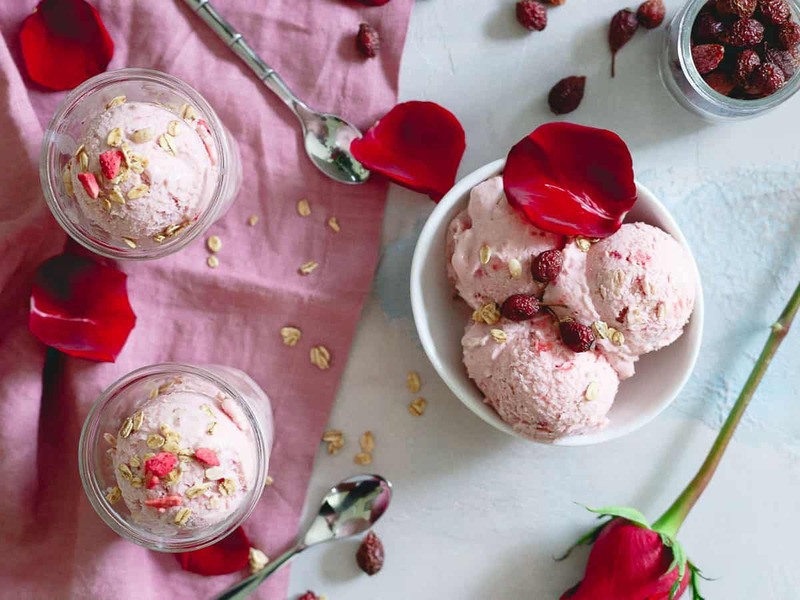 What that something was, I had no clue at the time but when those unusual ice cream combinations caught my eye in Mexico, I knew these fun dried rose hips had to become ice cream somehow. While you can’t really eat a dried rose hip as is (unless you’d like to break a tooth), they’re frequently used for making tea (and packed with vitamin C and antioxidants – something I totally didn’t know!) which is what gave me the idea to steep them in a milk and honey mixture to extract all their floral, lemony flavor. The addition of strawberries is two-fold. Obviously, the flavor and spring season make them a great addition but I also wanted their beautiful pinkish red color. The rose hips themselves don’t really impart any color in the ice cream but obviously when you think of roses, you think red and strawberries help bring that to life. 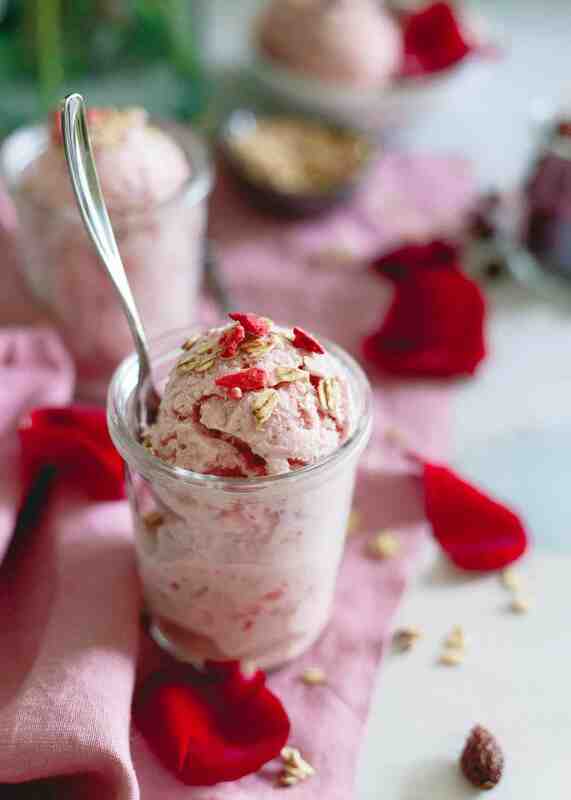 This rose hip ice cream is actually half frozen yogurt too. It’s creamy like ice cream, especially when in that semi-frozen soft-serve like state but just a bit tangy like frozen yogurt. I love how the tang goes along with the subtle rose hip and strawberry flavor. The granola is optional but its added texture is actually one of my favorite parts. Trip #4 to Cabo is planned for February of next year so until then, I’ll just be over here counting down the days until my next Flora Farms visit and living vicariously through this rose hip ice cream or some other unique flavor combination like maybe sweet corn bacon ice cream or chocolate coconut avocado ice cream until then. Check out all the products Nuts.com has to offer on their website or catch them on Facebook | Instagram | Twitter. 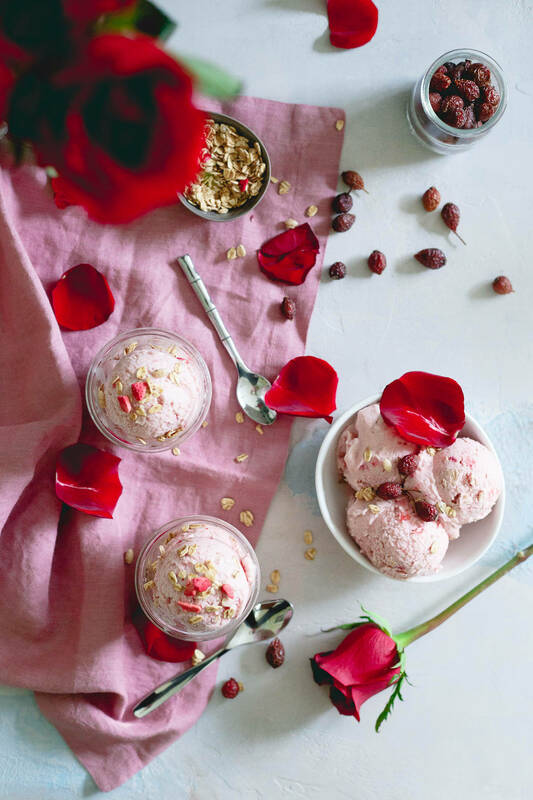 This rose hip ice cream is made with half milk, half Greek yogurt for the perfect balance of creaminess and tang. It's filled with strawberries, granola and infused with a subtle rose hip flavor making it a great spring dessert. Combine the milk and honey in a small sauce pot over medium-low heat. Whisk until honey is dissolved and milk starts to steam but not boil. Add the rose hips and vanilla to the pot, turn off the heat, cover and let steep for 15-20 minutes. Strain the milk mixture through a fine mesh sieve removing the rose hips and place in a blender. Add 2 cups of the strawberries and blend until smooth. Add the Greek yogurt and blend again until smooth. Add the remaining cup of strawberries and blend for just 1-2 seconds until incorporated into the mixture but small pieces still remain. Transfer the mixture to a bowl, cover and refrigerate for at least an hour until well chilled. Remove mixture from the refrigerator and churn in an ice cream maker according to manufacturer's directions. Add granola in last minute of churning. Transfer to a freezer safe container and freeze until set, 3-4 hours. For a softer ice cream, only 2-3 hours freeze time needed. What a creative ice cream flavor Gina! Love the added granold for texture. Sounds like you had a wonderful trip. I’ve never been to Cabo, but sounds like I need to add it to my bucket list. I love the subtle flavor of rose in food. I’ll bet this ice cream is lovely! I have NEVER tried Rose Hips! I totally need to get on this new-to-me flavor because it sounds sooo good! So pretty too! This is so creative and pretty! I have definitely never tried adding rose hips to any recipes. So cool. I love rose in everything!! Looks so beautiful! LOVE nuts.com and I’m so intrigued by the dried rose hips!! You have crated real beauty with special ingredients ! Thank you so much ! I love that you used dried rose hips! I wouldn’t suggest it as it will be quite icy rather than creamy. Coconut milk (from a can – full fat) would be a preferable substitute if you don’t want to use regular whole milk.